When Kat McCann and I first discussed the possibility of a post, it was initially to talk about her love for black cats. As she began to tell her story, it was obvious to me that she is clearly a cat lover, but that she had a unique experience, and fortunately she was willing to share it with me. And that extraordinary tale was when she evacuated during Hurricane Katrina with her two cats, with a third joining her shortly thereafter. In the first part of Kat’s story, we learn about her love for cats and the two that were with her right before and during the storm. I hope this post helps remind people about the importance of being prepared for a disaster when you have pets. Kat’s story, to me, also shows the love that one woman has for her feline friends. Before telling the story of Katrina, let’s begin with Kat’s life prior to the storm to give you a little background on her love for cats and how two of her cats, Blackie and GrisGris, came to live with her. Growing up, we were at the edge of the city, and my family seemed to always have dogs and chickens, but no cats. I was about eight years old, when I found a stray white cat under a bush in our front yard. My dad said no, but eventually grew to accept Kit Edward Snowball. Mom explained to him that the cat chose me – and that was that. While I do love all animals, over my lifetime I have had guardianship of 17 cats, of which 11 are/were black. Bathsheba was my first black cat, a stray kitten that kept jumping in my first husband’s car. We had her for 15 years. I knew the stories about them – how some viewed them as bad luck. But once I had Bathsheba, I saw firsthand how people were actually prejudiced against them. I found Bathsheba to be exceptionally loving and smart! I taught her several tricks. 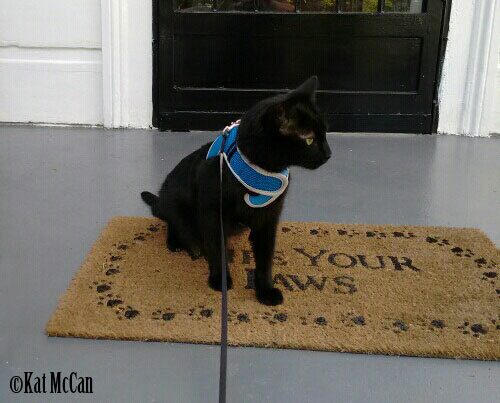 It was a shame that I couldn’t show all of my friends, as there were some who didn’t come to see me because I had a black cat in my home! Needless to say, they didn’t remain my friends for long. After Bathsheba went over the rainbow bridge, my then husband and I each adopted a black cat – Antigone and Cleopatra. Antigone (Ginny) was a kitten abandoned with her litter mates in a lady’s backyard and was feral. Once I got her to come to me, she trusted no one else. Cleopatra (Cleo) was from the SPCA. She was a polydactyl and was my husband’s cat alone. We were a happy family. Then a year later, Blackie wandered into our backyard. She didn’t want anything from us but food and to lay on our back porch. One day, though, I saw that Blackie was limping. I somehow captured her and got her to the vet, where we found out a dog had gotten hold of her. $200 later she was good to go – inside. Blackie was happy to be inside where the dogs were not. When my first husband and I divorced, I got custody of Ginny and Blackie, and we lived our lives happily as a female family. After a time, I was at a bookstore where they were having a pet adoption, and I absolutely fell in love with a very vocal, active black kitten! I called him GrisGris. He became my best mate, and the ‘girls’ fell for him as well. Everything went great for a time, but then Ginny got cancer and she joined Bathsheba over the rainbow bridge. Ginny was 14. I was sad, but I knew that she had a long and happy life. At that time, I still had Blackie and GrisGris. 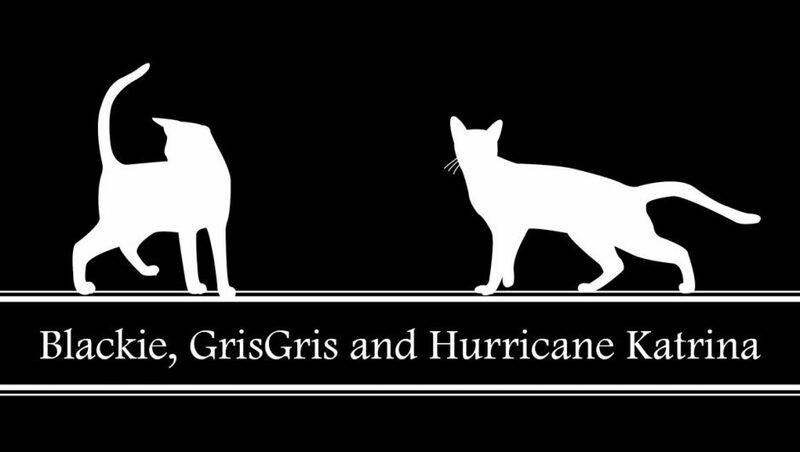 Blackie and GrisGris joined Kat in her journey as she escaped Hurricane Katrina, and Kat will share more about that in the next part of our series. But first, I asked Kat to share a little more with us about her cats. Since Hurricane Katrina, Kat has added five more cats to her household – Kizzie, Jockamo, Feenanay, Mojeaux and GiGi. 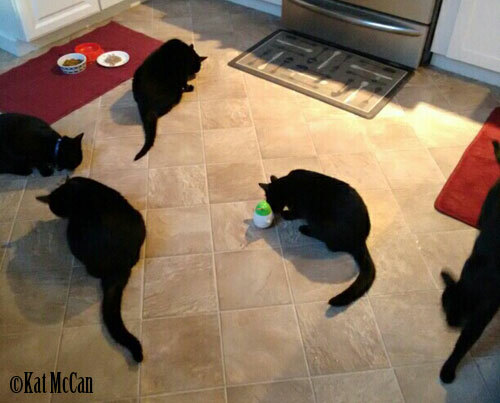 And you guessed it, all are black cats! While some found her, Kat has also adopted from rescues. Jockamo, one of the additions since Katrina, keeps lookout on the porch. Kat and her second husband, Dennis, don’t have children of the two-legged variety, but of course their cats are their children! And no doubt that the experience Kat went through with Katrina, she is more aware than ever of needing to think ahead and plan long-term. Kat and Dennis have made provisions for their cats in their will. They visited their attorney, a fellow cat lover, and dictated that whatever cats they have will be provided for and they have also found guardians who have agreed to their care. 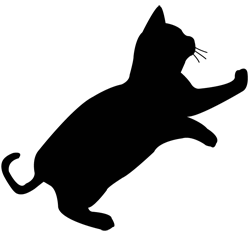 Please join us next week for Part 2 as Kat tells the evacuation journey with her two cats during Hurricane Katrina. And in the final post, find out what happened and which cat joined Kat’s feline family in the midst of the disaster. Feeding time at the McCann household! This is just a small list to start with. If you know of other animal organizations helping, you can leave them in the comments. Thanks for sharing Kat’s stories with us. We can’t wait to hear about evacuating because of Katrina. What a scary time! And now with all the recent flooding in Louisiana, it must bring back those memories. Thanks for sharing their story! So many beautiful black kitties! We can’t wait to read the rest. Thank for sharing! I await the next part! This reminds me of a story a read a while back about public tornado shelters in Oklahoma. Apparently, pets aren’t allowed – which means anyone seeking shelter with a pet has to choose between seeking shelter without the animal (leaving it outside unprotected) or being unprotected to stay with the animal. With tornadoes, seconds and minutes count and I can’t ever imagine having to make that split second decision! Actually, for me, it wouldn’t be a decision because there’s no way I’d leave Bear like that – but everyone is different. What a wonderful story. I’m looking forward to part 2. “Grisgris” is a brilliant cat name. Such an amazing atory and an amazing family. We will look forward to reading the next one too! I have been looking forward to this series ever since you told me about it. Can’t wait to read more next week. Great idea to include background on how her love of cats all began. I remember Hurricane Katrina so well. Some fellow animal rescue volunteers and I had a supply drive for the displaced animals and two volunteers then drove all the donated items down from Chicago to LA. They also volunteered for a week or so with some of the rescue groups and the animals that were set up in makeshift shelters. They brought home a cat and a rabbit. At the time I was about four months pregnant and my doctor and husband talked me out of going with them to volunteer in New Orleans. I suppose it was for the best, but I still regret not going – would have been a great story for Madeline later in life. Wow, that would’ve been quite an experience. It was great that everyone came together in other regions to help. We remember reading the horror stories of animals left behind. It was so sad to read. We can’t imagine having lived through Katrina. I can’t even fathom what Louisiana went through during Katrina and is going through again. Thank you for featuring Kat’s story here and we’re looking forward to part 2. Wonderful start to the series! I can’t wait to read more! And, I have to say, since live in a hurricane zone, if my cats weren’t allowed to evacuate to a shelter, neither would I. It’s all of us or none of us! I love black cats, I have 3 now since Spooky went to the Bridge in April. I love hearing of other big cat families. TW’s best friend—the vet tech that wrote that declawing piece—is down in “Ground Zero.” She lives in Livingston Parish in LA. She’s been spending her days in waist-deep water trying to save neighbors’ pets. I’m trying to get her to write something for my blog for she’s way too busy. I can give you a list of ways to help them locally. Oh wow, I’ve seen the videos of some of those rescues. Thank goodness there are people like her who are willing to help like that! Wow! What an amazing story. We can hardly wait until part 2! Wow is right! Can’t wait to continue to read. Thanks for sharing the links for those in need too. Great article and pawsum fotos. We of course luv all cats, includin’ da black panfurs and don’t unnerstand peeps who don’t. By da way, ‘specially fur this flood situation, bein’ in da Baton Rouge area, our media church JSM.org is a disaster relief area and is givin’ out furee supplies fur those in need, includin’ pet supplies. They usually offur housin’ immediately after a situation as well. They pawrtner with FEMA fur all disasters. Anyways, just thought we’d mention it. Can’t wait to read what comes next! Some people at my school took in families after Katrina and the kids went to school with us. I’m glad to hear there’s new procedures for evacuating pets. I saw some heart breaking images during the hurricane. Recently in Canada, West Jet Airline flew people out of Fort McMurray fires with their pets – best PR move the company could have done. this is a compelling story…all of those sweeties in the photo are precious. Can’t believe she is having to endure this again!! Thanks for sharing Kat’s story, I’ll look forward to reading the next instalment. I’ve only had one black cat – Angel Rose who was a black fluffy girl and a wonderful companion. This is such a beautiful beginning to what is sure to be a wonderful series. I can’t wait to read more! There is never enough awareness and disaster preparedness. When our neighbors managed to get their house on fire, they found themselves standing outside the burning house, in their pajamas, having no idea where their dog was. Poor thing was hiding under the bed and fortunately the firemen saved him. Thank you so much for sharing this wonderful story, my biggest fear is Layla being alone when a disaster hits although I am well prepared for it in all ways. Katrina was horrific for all involved, it’s good to know that a bill has now been put into place for pets and their parents. What a wonderful story, amazing how cats find their humans ❤ looking forward to part 2 of your series. Thanks for sharing the Louisiana information. So many people will need it, and we will share if we know of anyone who asks about it. This is an interesting story and we can’t wait to read the rest! Thanks for sharing this series. We can’t wait to read the next part. Living in a hurricane zone ourselves, we think The Pets Evacuation and Transportation Standards Act is incredibly important. This is wonderful and I remember Hurricane Katrina very well. It’s so sad to think another community in LA has to go through the devastation again. It’s great that you are bringing up awareness! Black kitties are pawsome! Humans are so weird when it comes to superstitions about things that are black. You would think we would be beyond “bad luck” beliefs in 2016, but we’re not. I look forward to the rest of this story! Hurricane Katrina was a very moving time in recent history. My heart goes out to those dealing with flooding in Lousiana right now. Thanks for sharing Kat’s story with us. I really feel for the people of Louisiana right now. We went through a major flood last fall and many people were separated from the fur children and homes. Great story! Looking forward to part 2! Gosh, nature can be hard!! I hope the people in Louisiana are doing ok :(! Water and fire can destroy everything! When I see the footage on the news from hurricanes, floods,.. it breaks my heart!! That is fantastic there is legislation in place to look out for pets in need of evacuation! This was a lovely story. I especially like the fact that those friends, who didn’t want to come over did not receive future invitations! Good for you, Kat! What a truly wunderful tale, we can’t wait fur the next part! So important to be prepared. I can’t imagine living through Katrina or the other disasters and my heart goes out to Louisiana. Looking forward to the next instalment. Love all the beautiful black kitties. Kat, people wouldn’t visit because you had a black cat? That’s pretty moused-up, for sure. Peep #2 tells me that in Scotland, black cats are considered lucky. I think the Scots must be smarter than most, don’t you? My heart sunk when I saw the recent flooding in Louisiana. I always get that sick feeling, having had to evacuate twice for near flooding. I appreciate you sharing Kat’s story and I enjoyed this post. I can’t wait to read the rest of the story. I hope all cats were safe! So happy I stumbled on this post but I wish I’d known about Kat and this story sooner! Great story for my book but we’re in final edits. We need more responsible cat owners like Kat!